Online Tournaments are available at online casinos which are quite popular among pokies players. Many online pokies casinos offer such tournaments for gamers to enjoy and challenge other players. These online tournaments can be played in real AUD or BTC or any other native currency by just joining that online casino and registering yourself to play. There are pokies tournaments, table game tournaments, Bingo play tournaments, Scratchies and other games tournaments at online casinos. The most common one is pokies tournaments followed by Blackjack and poker game tournaments. In pokies tournaments players compete on a specific online pokies chosen from the casino’s game list. It can be any game: 3 reel or 5 reel, classic pokie or video pokies and, all you have to do to take part is sign up in the ‘tournaments’ section of the casino lobby. Once signed up, you will be given a number of credits. Then, all you have to do is spin the reels of the designated game using these credits. As you play, your winnings will be added up and you will make your way onto the leaderboard. The top finishers will be rewarded a prize. Keep in mind that prizes can be handed out as far down as 2,000th place, so your chances of walking away with cash money is very high. There are many types of online tournaments available to play at online casinos. Scheduled Tournaments: In this type of tournaments online casinos offer tournament schedules. They stand apart from other types of tournaments because they are set to start and finish at a certain date and time. To take part in them, you just visit the tournament section of your favorite online casino when registration opens up. Sign up and wait until the set starting time. These tournaments can last as little as a few hours or as long as a month. Sit n’ Go Tournaments: These tournaments are a quick version of scheduled or buy in tournaments. They are usually offered 24/7 with no scheduled starting time and offer a limited number of seats because the starting time is determined by those seats filling up. To take part, you need only to get to the casino and sign up. When your opponents fill all available seats, a popup window will let you know it is time to start spinning the reels. These tournaments do not last as long scheduled tournaments. These can last as little as 10 minutes or as long as a day. Buy-in Tournaments: These tournaments require players to pay a small entry fee in order to participate. These fees are always under $20 and often contribute to the prize pool on the tournament. To take part, get to the casino and sign up. You will be prompted to pay the registration fee and be given a number of credits to spin the reels. Online casinos will offer a range of entry fees, meaning that there is a buy-in tournament to suit all budgets out there. 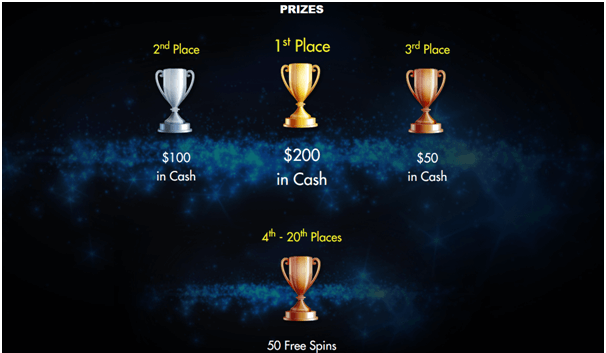 Freeroll Tournaments: Highly appreciated these tournaments are completely free to enter and can bring in a massive amount of money. Because they are free players like them the most. Freerolls are not quite as frequent as buy-in tournaments, but online casinos will offer one or two each month. All you have to do is get to an online casino offering a freeroll tournament and sign up! Then show up on the starting date and spin the reels for a chance at a piece of the prize pool. Mostly such tournaments are offered for the game of poker. At poker sites you can easily enter freeroll tournaments to play. You need to be a new player to enter such tournaments, or many online casinos want players to earn a set number of points first in a month or so play before having a free roll. How to take part in Online Tournament? To get started to be in an online tournament is quite easy. Visit a Aussie friendly online casino like Rich Casino, Superior Casino or Slotland casino with your mobile or PC or Tablet. Open a casino account by registering yourself at the casino. Go to tournaments section or ask the customer support about the ongoing tournament and join. Many online casino organise Freerolls every single month of the year. While entry is free, these tournaments come with add-ons which allow you to buy additional credits and potentially increase your chances of winning. In a free roll tournament you got an amount of credits to play with. 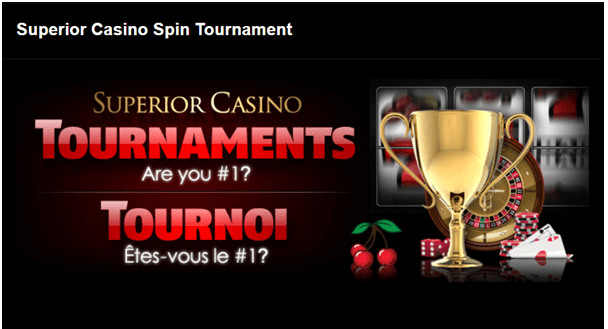 You’ll need to go to the tournaments section in the casino software and choose a tournament. Once the time is up, winners are determined according to the amount of credits on the machine. Those with the highest amounts make it to the leaderboard and collect the awards. Seeing your name among the winners is always hugely rewarding. Your winnings are credited automatically into your player account. Before you start to join a online tournament at any online casino remember that there is no guarantee that you will be a winner. Because pokies is a game of chance and results are generated randomly. The only thing you can do is concentrate on your game play and don’t get distracted by other players and their ranking. If you’re playing a multi-payline game, consider playing all of the lines. Betting max is recommended by many, but that’s really up to your budget and how much you wish to risk your real money. You could end up busting out, but on the other hand, if you win, you’ll win big. Where can you find the best online tournaments? Though many online casinos accept Aussie players for their online tournaments, but 7 Reels casino and Rich Casino is popular name. 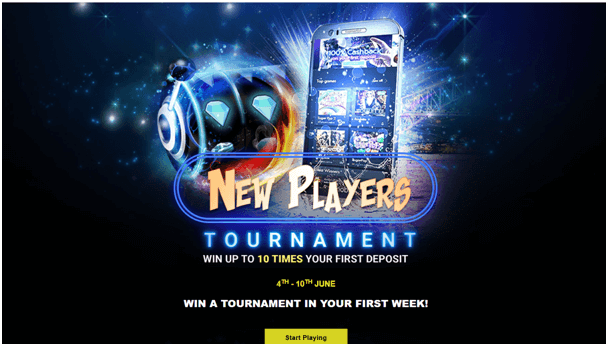 At the time of writing the 7 Reels casino was offering players new player tournament where you can win up to 10 times your deposit just in one week. Our top winner will receive the first prize of $200 cash! Now how is that for a warm welcome! Just join the casino to get started. When done, go to promotions and click on new player tournament or in many online casinos your screen will feature an additional tab titled Tournaments. Then start spinning the reels, for your chance to make it into their top 20! You will be awarded 1 point for every $1 wagered on the selected pokies games. Also at the time of writing there was ongoing Blackjack tourney too at 7 Reels Casino. When playing pokies game as a new player at the casino makes your entry to a free roll tournament, offers you rewards to play more of a certain game or taking part in a tournament series. It is a small price to play for loyalty and gives you some extra value for your play. Freerolls help you lay the foundation for your bankroll. That means you can move up in the game without having to spend a single penny. There are many VIP player tournaments too at online casino that cater only to VIP players. Before taking part in the tournament contact the customer support for more information and details. Finally remember that tournaments don’t require any special skills, which means you can enjoy them and have fun.